Features: Made of high quality material, practical and durable. Applicable to wood, ceramic tile, plastic, composite materials, wall, aluminum alloy, metal, glass, such as cutting, milling, milling, grinding, carving and other operations. It has been through testing standards. Specification:. DeWalt 18V Brushless Cordless Combi Drill & Impact Driver. With 2 5Ah Batteries Contains:|DCD796 Compact Brushless Hammer Drill|DCF887 Brushless Impact Driver, 2 x 5.0Ah|Slide Pack Batteries, Multi-voltage charger,|DS150 Tough System Kit Box . used tools . Condition is Used. Collection in person only. 24 grit pads are ideal for surface prep and getting your product down to the level you need it. 25 Piece 2" Roll Lock Conditioning Discs. 2" Roloc Type R Compatible Roll Lock. Quick Change Surface Conditioning Discs. The impact driver features a compact and lightweight design, ideal for use in confined spaces. 1 x 18V Brushless Combi Drill 65Nm. 1 x 18V Brushless Impact Driver 170Nm. Brushless Brushless. 2 x 18V 1.5Ah Li-Ion Batteries. 2" Roloc Type R Compatible Roll Lock. --24 grit pads are ideal for surface prep and getting your product down to the level you need it. 25 Piece 2" Roll Lock Conditioning Discs. Quick Change Surface Conditioning Discs. 12 x Delta sander pads. MIG-150 Gas Gasless Flux Core Wire Feed Welder Welding Machine Semi-Automatic UK. PVC Pebbles Shell Starfish Anti Non Slip Strong Suction Bath Shower Mat Safety. Power Source : Corded Electric. Black & Decker Mixed Accessory Set. 32 Piece Handy rollmat keeps contained hand tools and accessories safely stored and easily accessible. Fits easily in larger storage cases.|A wide range of screwdriver bits to fit all commonly found screw types.|Powered screwdriver included to make screwdriving easier.|Ratchet and sockets set for loosening and tightening of nuts and bolts|Allen key set for loosening and tightening of allen key screws|Magnetic picker enables the retrieval of dropped nuts and screws|Flexible wrench for the adjustment of nuts and bolts.|Long nose pliers for use in tight spaces. .
Black & Decker Mixed Accessory Set. 80 Piece A multi piece accessory set containing the most common accessories for DIY tasks . HILTI 12V SET, 5 TOOLS: SID 2-A, SFD 2-A, SF 2-A, SL 2-A, SR 2-A. 1x HILTI SFD 2-A. 1x HILTI SID 2-A. That is a complete and exclusive Hilti 12V set. 1x HILTI SF 2-A. 1x HILTI SL 2-A. 1x HILTI SR 2-A. Function: Tools crowbar. 1 Pry tool. Can quickly remove plastic fasteners from door panels of most cars,trucks, etc. Material: Plastic manganese steel. Color: Red black. We will always here to solve them for you. We will always here to solve them for you. It won't help the problem to be solved. 1 Pry tool. Material: Plastic manganese steel. Color: Red black. Remove battery from adapter when not in use. -We are not associated or affiliated with either Ryobi Limited or Makita Corporation. Credits should be given to both Ryobi and Makita. 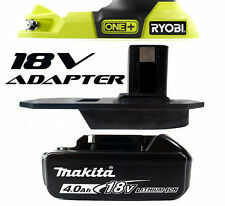 -This adapter has no copied parts of either Makita or Ryobi and has been independently engineered. Color: Red black. 1 Pry tool. Material: Plastic manganese steel. We will always here to solve them for you. It won't help the problem to be solved. 1 Pry tool. Material: Plastic manganese steel. Color: Red black. We will always here to solve them for you. It won't help the problem to be solved. Color: Red black. We will always here to solve them for you. It won't help the problem to be solved. 1 Pry tool. Material: Plastic manganese steel. Remove battery from adapter when not in use. -We are not associated or affiliated with either Ryobi Limited or DeWalt. Credits should be given to both Ryobi and DeWalt. 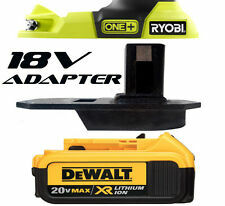 Dewalt Battery Adapter to Ryobi 18v Tools - YouTube. 220V 5mm Fan Fully Two-holes Enclosed Electric Grinding Polisher Acrylic Dust Box Cover#300136. Characteristic Apply to table polisher. Molding plate thickness 5mm (Due to the material of acrylic itself, molding plate generally have about 0.3mm tolerance.). Function: Tools crowbar. 1 Pry tool. Can quickly remove plastic fasteners from door panels of most cars,trucks, etc. We will always here to solve them for you. It won't help the problem to be solved. Remove battery from adapter when not in use. -We are not associated or affiliated with either Ryobi Limited or Milwaukee Tool Corporation. Credits should be given to both Ryobi and Milwaukee. 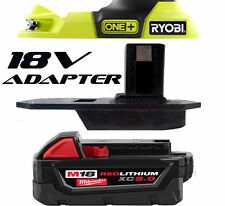 -This adapter has no copied parts of either Milwaukee or Ryobi and has been independently engineered. 1 Pry tool. Material: Plastic manganese steel. Color: Red black. We will always here to solve them for you. It won't help the problem to be solved. 1 Pry tool. Material: Plastic manganese steel. Color: Red black. Function: Tools crowbar. With 37pcs Accessories kits. Boat Rod Holder. Buffer Pad. Boat Ladder. Boat Cup Holder. Boat Light. Deluxe Kit Includes Diamond Tile Cutter. The cordless tool set also includes a B&D carrying bag for easy portability and storage. Cordless Tool Set. Black & Decker high-quality power drill & tools collection. 67 Hand tools, accessories, and drill bits. Stanley Black & Decker Bd4kitcdcrl 20v Max 1.5Ah Cordless Lithium-ion 4-Tool Combo Kit, Orange/Black. (BD4KITCDCRL). The BLACK DECKER BD4KITCDCRL 20V max Combo Kit features a drill/Driver, a Circular saw, a Reciprocating saw, and a work light. Inner splined much tooth spline bit set hex hex nut 1/2 "3/8" 10 mm 40tlg. SPLINE Bits Nut 1/2 "3/8" 10mm 40tlg CrV. CONFIDENTIAL with your data. Do not miss anymore! Tools & Werkstattbeda RH. Competent Advice. Reciprocating Saw Specifications. Bevel Capacity: 0-45 Degrees (Left). Circular Saw Specifications. Chuck: 1/2" Keyless. Torque Settings: 23 Driving,1 Drilling. Swivel Capacity: 180 Degrees -Swivel Head Directs Light Where You Need It. Can quickly remove plastic fasteners from door panels of most cars,trucks, etc. Color: Red black. Power output: 25V. 10 x Electric screwdriver of different sizes&1 x soft axis. 4 x Long Electric screwdriver (one cross batch, double cross batches)）. 5 x different types of bit (six hornhandle twist drill 4.8mm/5.5mm/6.5mm, twist drill 6mm, tile bit 6mm). Function: Tools crowbar. 1 Pry tool. Can quickly remove plastic fasteners from door panels of most cars,trucks, etc. Material: Plastic manganese steel. Color: Red black. 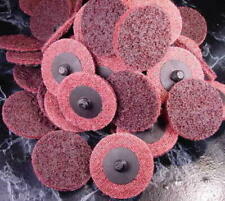 20pcs 38mm Polishing Buffing Wheel Pad Set. 1 Polishing Wheel Set(20pcs). Suitable for rotary tool or other polishing machine. Notes: The real color of the item may be slightly different from the pictures shown on website caused by many factors such as brightness of your monitor and light brightness. 1 Set angle grinders converter. Brush Kit Includes 2 Carbon Brushes. 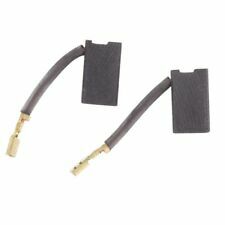 Includes One (1) Carbon Brush Set as picturedItem Specifications Material: Japanese Toyo Tanso Carbon. Color: Red black. 1 Pry tool. Material: Plastic manganese steel. Function: Tools crowbar. 1 Pry tool. Can quickly remove plastic fasteners from door panels of most cars,trucks, etc. Color: Red black. Lithium power, compact size, and ergonomic features combine to create a powerful, lightweight, Cordless Power Drill Set from Black & Decker. This specific cordless power drill set includes a 100-piece accessory kit to help you get the job done. 1 Pry tool. Material: Plastic manganese steel. Color: Red black. Function: Tools crowbar.